As the sun broke over the hills than cloak this beautiful camp in mystic loveliness, Timberlake woke up and began the daily march down to breakfast. This morning, the campers were treated to a glorious meal of waffles, whipped cream, and blueberries. The dining hall was nearly silent, as each and every camper chowed down on his morning meal. Following breakfast, Timberlake convened outside the Tucker Inn for the morning yell, led by Cabin Area Director Ryan W. Today, the morning yell focused on themes on unity and perseverance. You can’t beat that at camp! Later in Chapel, Brad S. led worship for his gold bar in guitar and did an incredible job! He played three songs along with the guitar counselor and captivated counselors and staff alike with his ability to shred. Afterwards, the message focused on Jesus’ sacrifice that he paid for all of our sins. That message sure is powerful! After Chapel, all the campers went back to their cabins for cabin cleanup. 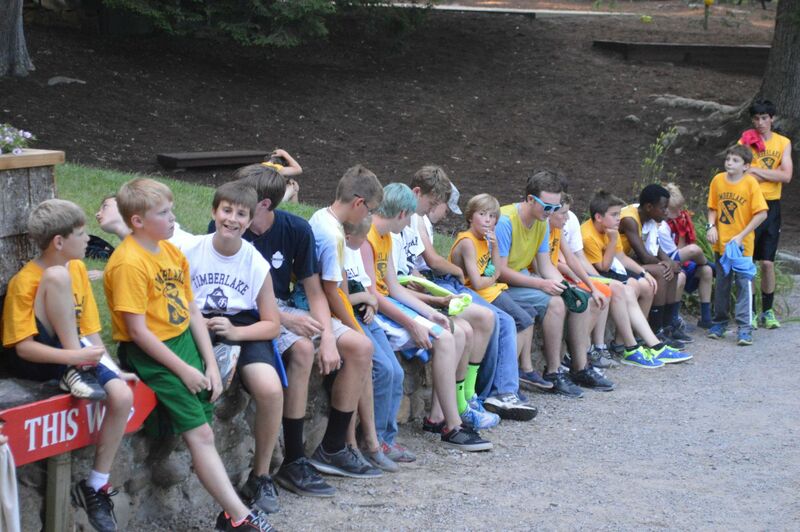 Excitement was abounding as campers had the youngest cabin, Tomahawk, in their sights. Tomahawk had established an unlikely dynasty, and just the thought of ending the dynasty had every camper on his hands and knees scrubbing every nook and cranny that he could find. After cabin cleanup, Timberlake went their separate ways off to first period. In riding Mason B. learned some new skills and was riding the horse around the riding ring like a jockey in the Kentucky Derby. What a pro! All the way across campus in riflery Jesse B. showed off his prowess behind a gun and was taking out targets like the best shooters in the world. In swimming, Drew W., Quinn M., Brad S., and Calvin T. perfected their breast stroke kick and later the stroke. These four guys had already mastered freestyle and backstroke, and with the addition of breaststroke to their repertoire, they only have to learn butterfly. Look out Michael Phelps! A new breed of swimmers is entering the water and they come from Timberlake! In second activity, William M. rocked out on the new tower, climbing two of the routes all the way to the top and saw the best view in camp! In tennis, Jimbo D., Drew J., and Houston J. warmed out with their forehands and backhands and then moved to a lesson focusing on serving. With Timberlake Wimbledon in the near future, these three guys couldn’t be perfecting their game at a better time. Timberlake then reconvened for lunch and recharged their batteries over a delicious meal of tacos in a bag, traditionally a camper favorite. Tacos in a bag consist of a bag of Fritos, taco meat, preferably beef, and any other toppings the consumer chooses to endow his lunch with. Normal toppings including lettuce, cheese, onions, and tomatoes, but some campers go outside the box and throw on some sour cream and salsa. Yum! After each Timberlaker had finished eating, the focus turned to the announcements. Who would win cabin cleanup? Would it be Tomahawk? Or would it be Greybeard, the oldest cabin? However, to everyone’s surprise, the perennial favorite, Tomahawk, finished last with a 9 out of 10! Wow! No one saw that coming! Cabin by cabin the results were rattled off, and everyone was on the edge of his seat. Next came Little Slaty, then Big Slaty, and then everyone’s second pick, Greybeard, was announced in third place! Suddenly, the daily race was down to just two, Stomper’s Knob and Little Piney, two cabins that traditionally have not performed the greatest. But today, Little Piney overcame all the odds and won their first cabin cleanup of the summer with a 9.9 out of 10! What a performance! After all the excitement of lunch, Timberlake went back up the hill for a much needed rest time. After thirty of the quietest minutes I have heard in my eight summers of camp, it was time for trading post and ninety minutes of free time, usually the favorite time in a camper’s day. Today, Timberlake was treated to a free swim that most of camp showed up for. The weather was perfect, the water not to cold, and the music just loud enough to dance to. After a glorious free time, camp again went their separate ways for third and fourth activity period. In airsoft, AJ J., showed his abilities both in bravery and leadership and led his fellow campers to multiple victories on the field. In archery, Lewis K. made it rain and recorded one of his best scores ever! In backpacking, Josef M. used his new knowledge in order to start one of the greatest marshmallow roasting fires that I have ever seen. Later, Griffin P. learned some new takedowns in wrestling and in soccer, Luke S. showed off his ball handling skills and took over a game of world cup. I wouldn’t be surprised if we saw him in the actual world cup in a few years time! Tyler S. had a great time in fencing even won a couple points off the instructor! Finally, Timberlake got together one final time for a thanksgiving feast in June. A scrumptious meal of turkey, stuffing, peas, mashed potatoes, and rolls was served and again the dining hall was nearly silent as campers and staff alike chowed down. At the end of the meal, the evening activity, Stealing Skins was announced! Stealing Skins was instituted last year, and quickly became a favorite among Timberlakers, as this game pits the two tribes, the Seminole and Iroquois, against a new adversary, staff. I can hear the screams of joy as I write this and I can assure you, everyone is having a great time. The Dawning of a New WeekAnother Great Day at Camp!